A variety of events took place to mark the Remembrance season, several of them focussing very strongly on Peace. 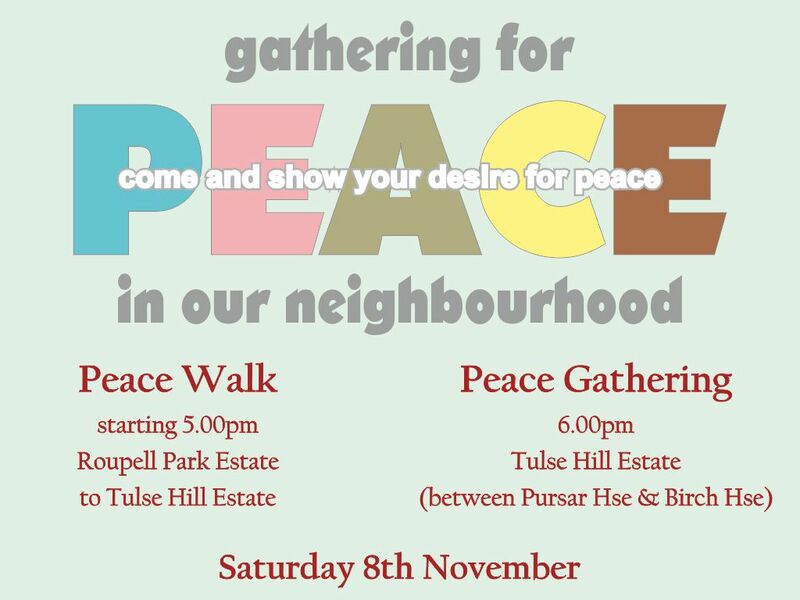 On Saturday 8th November from 5pm there was a Peace Walk from Roupell Park estate to Tulse Hill estate - in torrential rain! - and then a Peace Gathering of more than 50 people in the Jubilee Hall with welcome hot soup, peace messages, songs, candles and refreshments. All the result of an initiative by Revd Richard Dormandy, Vicar of Holy Trnity Tulse Hill. On Sunday 9th November from 10.30am the Annual Remembrance Service, organised by Roger Bowdery, took place at the War Memorial on Sreatham Common. Dr Smarajit Roy laid a poppy wreath on behalf of FTiL. Then on Armistice Day, 11th November, South Bank Churches organised a peace event, led by Steve Chalke, in St George's RC Cathedral for year 6 and year 7 students from 19 schools. Starting at 10.30am, the event led into the 2-minute silence at 11am. 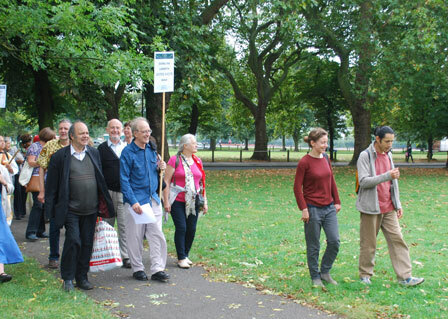 The Inter Faith Walk on 20 September 2014 was a west to east route from Clapham Common to Loughborough Junction. Six centres were visited: a church (Anglican), two Buddhist centres (one Tibetan and one Japanese by tradition), two Islamic centres (one Shi'a, one Sunni), and a Brahma Kumaris centre. 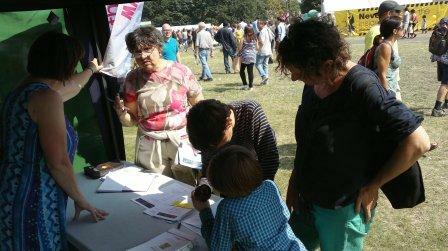 Lambeth Country Show 2014 - the 40th year! 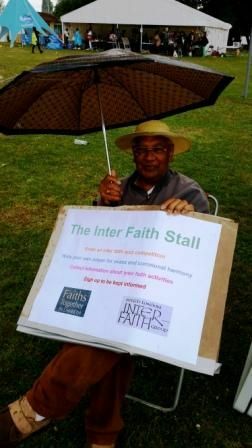 It ended early with a torrential deluge at 4.30pm on the Sunday, but by then 18 volunteers had looked after the Inter Faith Stall since 11am on Saturday, engaging with members of the public to enter the inter faith quiz, write a prayer for peace and communal harmony, or collect information on inter faith activity. 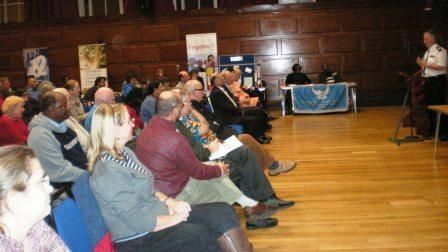 The Faith in the Community Event at the Town Hall on 21st November 2013 has been judged a great success, with almost 100 people attending. There were 17 stalls from different faith groups and other organisations. The speeches by Chief Supt. Matt Bell and Cllr. Lib Peck were both very good, as were Saleha Jaffer speaking more briefly about the Health and Belief project and Elizabeth Maytom about the Foodbank. The Council's support was crucial and we are deeply grateful for the interest taken by Cllr Lorna Campbell. Faith in the Community is an event that will take place in the Assembly Hall at Lambeth Town Hall from 6pm to 8pm on Thursday 21st November 2013 during national Inter Faith Week. The title is taken from a report by the all-party Parliamentary Group, Christians in Parliament, which is sub-titled 'Strengthening ties between faith groups and local authorities'. The aim on 21st November is a bit broader in that we want to strengthen ties not only with Lambeth Council but also with Lambeth Police, with the NHS in Lambeth and, in principle, with all aspects of the wider community. So we shall aim to celebrate contributions being made by faith groups to the wider community and to discover areas where such contributions could be enhanced. 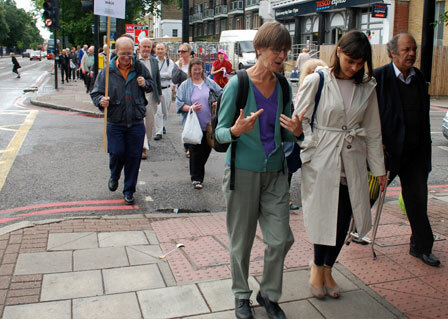 Walking down Brixton Road on Saturday 7th September 2013. 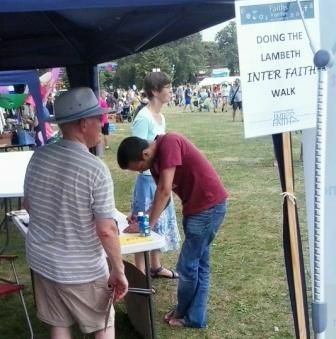 Faiths Together in Lambeth worked with South London Inter Faith Group, LAMAG, CCJ South London, London Boroughs Faith Network, Jamyang Buddhist Centre, Caribbean Hindu Cultural Society, South London Liberal Synagogue and others to run the inter faith stall at Lambeth Country Show in Brockwell Park on 20th and 21st July 2013. New features this year were the Inter Faith Quiz competition and the invitation to Write a Prayer. Congratulations to Alex Davey whose 50 out of a possible 60 was Saturday's highest score in the Inter Faith Quiz, and to the Wickstead family who achieved Sunday's highest score with 55 out of 60. Anton Bartick was presented with a Youth Faith and Hope Prize for Lambeth Youth Faith Forum on 24 June 2013. This is an award by Faiths Forum for London (FFL) and the ceremony took place at Methodist Central Hall in Westminster. 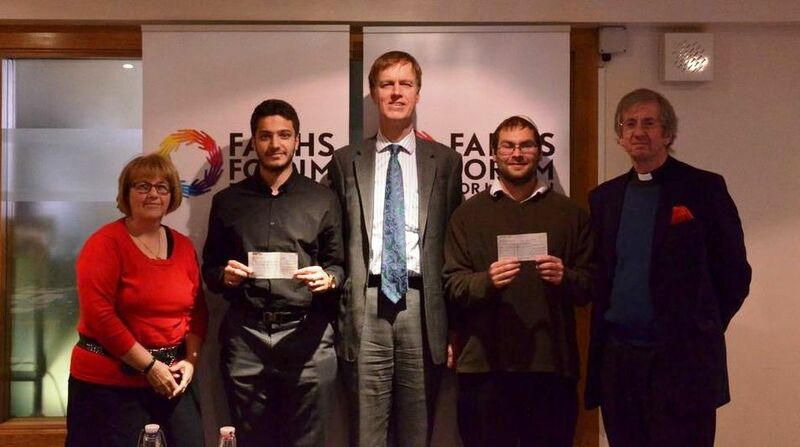 In the picture left to right are Leonie Lewis (co-chair of FFL), the prize recipient from the My Voice Project of the Al Khoei Foundation in Brent, Stephen Timms MP (who made the presentation), Anton Bartick, and Guy Wilkinson (co-chair of FFL). The Annual General Meeting was held on Tuesday 11 June 2013, 6.00p.m. – 8.00pm, at the Karibu Education Centre, 7 Gresham Road, SW9 7PH. Annual reports on activities and finances 2012/13 were presented. The Management Committee 2013/14 was elected. 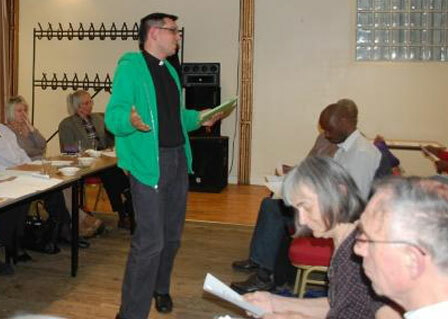 The business meeting was followed by a talk and discussion on Foodbanks by Revd Ben Goodyear of the Norwood and Brixton Foodbank. The following questions were addressed. How does the Foodbank work and how could FTiL members help? 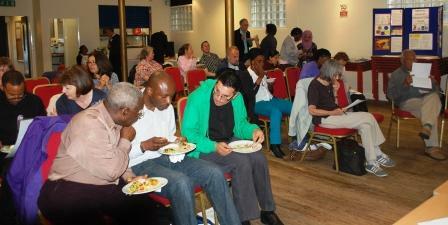 Do people of different faith backgrounds get referred to the Foodbank for assistance? Why do FTiL member organisations seem hesitant about becoming referring agencies?